It has been a busy week. Now after all the festivities we can settle into a more 'normal' routine again. Between the correfoc, which is really the start of the Sant Antoni celebrations, and Sant Antoni itself on the night of the 16th and day of the 17th January, we began quite a lot of pruning. We have some overgrown bougainvillea, which we began to prune a while ago, it seems to be a continuous job as it is such a tangled mess. Also some old pear trees, which didn't look as if they had been touched for years, I de-tangled one, which was overgrown by some flowing, climbing plant and have pruned back some of the branches and spurs. I will tackle a little more of those later this winter. 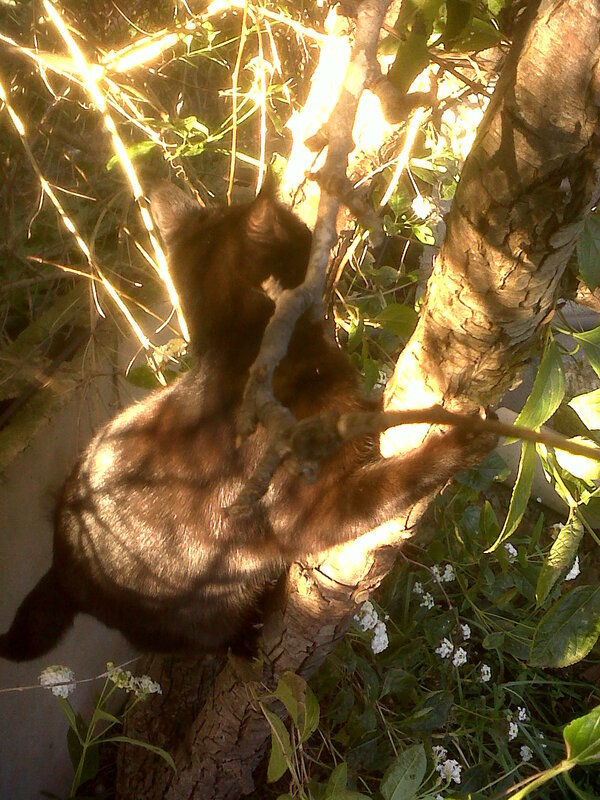 Samuel Sprat helping me prune the pear tree! Whilst pruning the dog rose I found a large grasshopper. 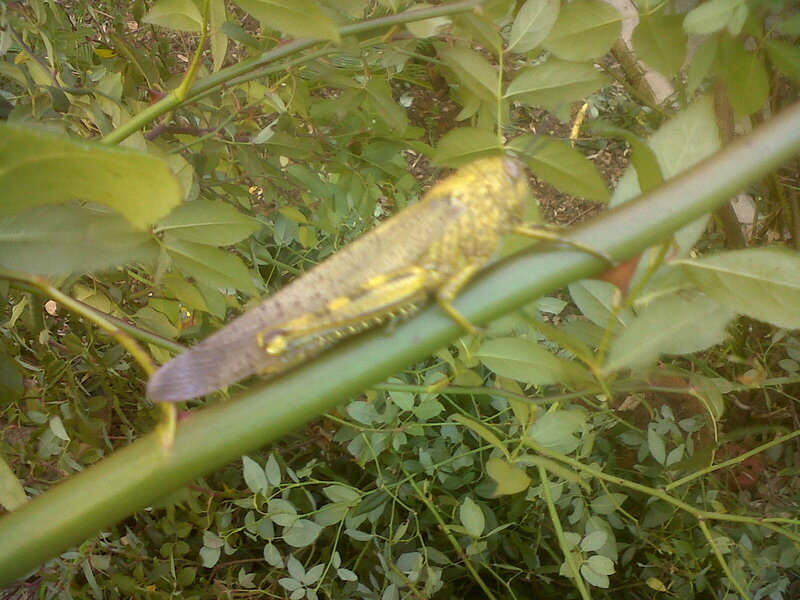 It maybe a locust or a cicada, I'm not sure, I haven't looked him up yet. But he was very green so I think he had probably only recently molted. 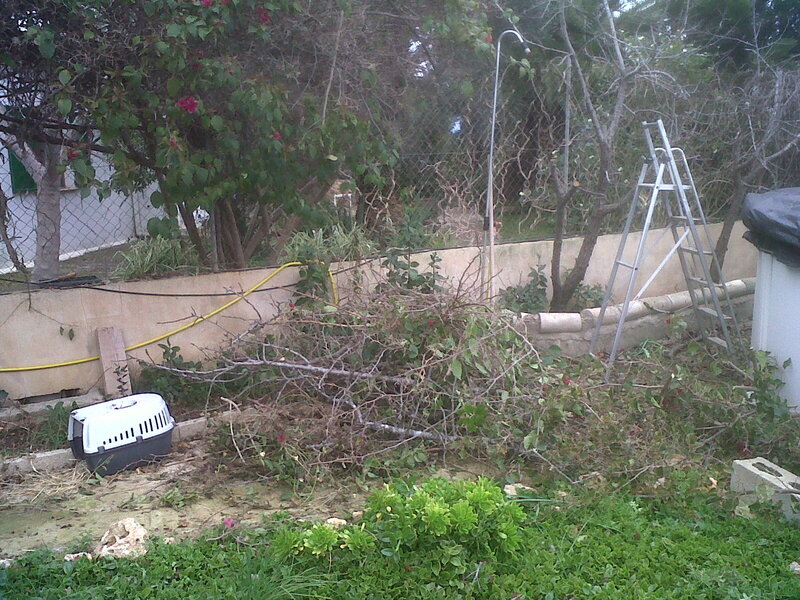 All the rose bushes (bar one!) are now pruned and ready for new growth to begin. The old infested apple tree roots etc have now been dug out and we had a fire on the earth it was in to kill off any bugs there. 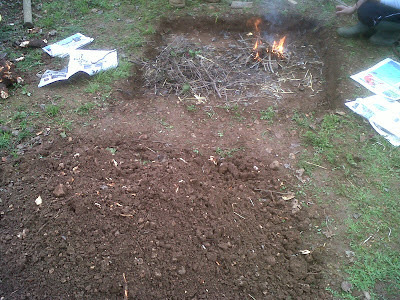 Starting a fire where the old infected apple tree was. 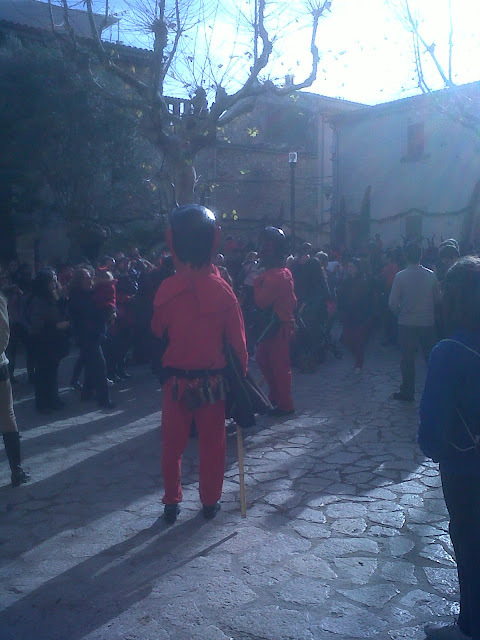 On the day of the 16th, J went to school as usual, but all the children from all the schools in Sa Pobla go on a traditional walk to and old area of land called Sa Llebre, where they collect wood and eat various Mallorcan delicacies such as sobrasada and botifaro, both are types of sausage and are made at the time of the matanzas (pig killings). We collected J from school at around 1pm today, and went home to have lunch. At 2.30pm we whizzed back to the town to the church where J waited with his devil's pitch fork for the dimonis (devils) to come out of the vicarage. The Dimonis come out of the vicarage and begin their walk/run around the town. All the fires are ready to be lit this evening. Older children play with fireworks and firecrackers/bangers by placing them in the fires before they are lit. 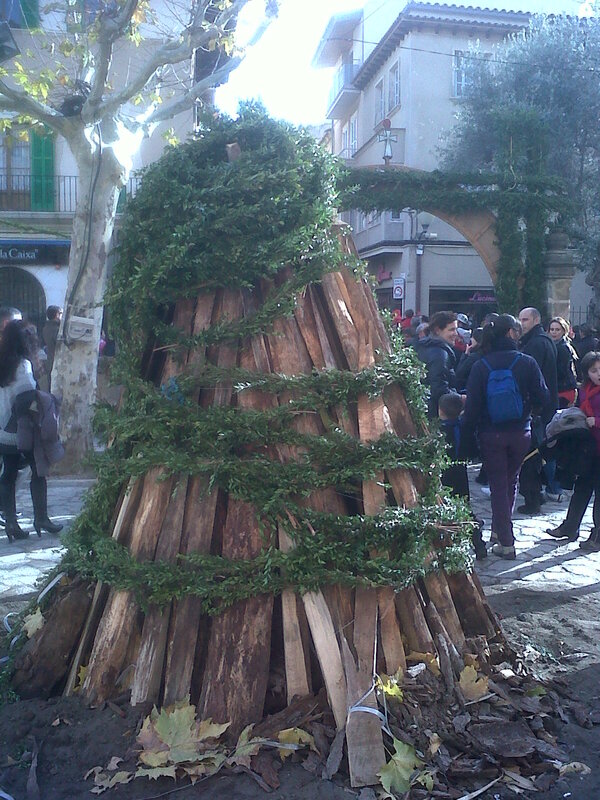 All around the streets are bonfires built close to the buildings, on cross-roads, by the bars and restaurants, and many are wrapped in herbs, olive leaves and various leafy brush, these are not lit until the evening. The devils appeared and everyone screamed in excitement because now the children chase the devils around the town and the devils chase the children and go into every bar/restaurant along the way. Some kids are terrified, understandably, even some of the adults run away! But it is all part of the tradition and it is great fun. I met several Mallorcan friends at the bar where I was having a drink and they were supposed to be having siesta but were too excited so came out to join in instead - excellent. A couple of hours later, we caught up with J, who was exhausted and thirsty. This year we gave him a mobile phone so he could keep in touch with us, we lost him last year, and it was a bit of a panic. Then we went home for a rest. 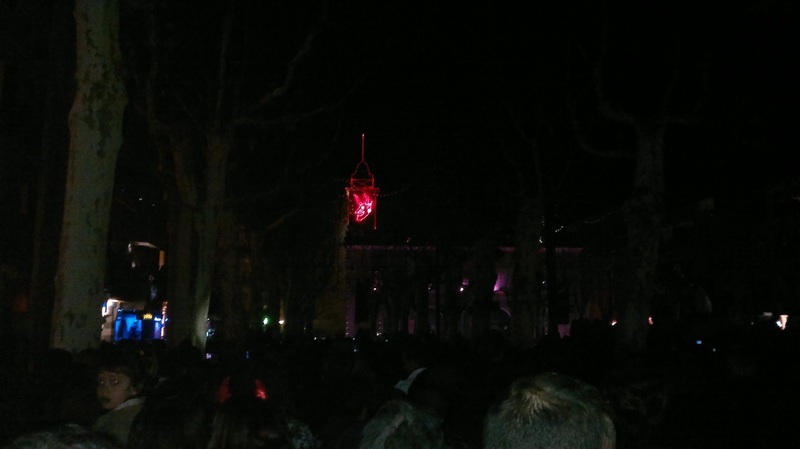 That evening, C, J and I went into town at about 9pm, we made our way to the main square (Placa Major) and were met with thousands of people. 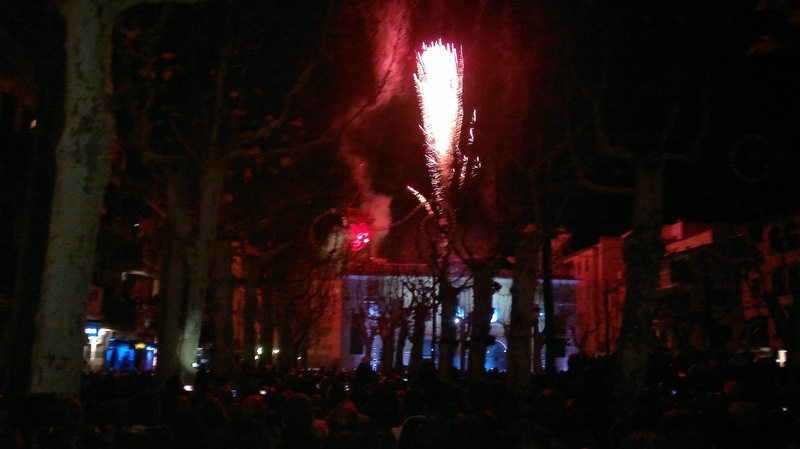 It was packed and we couldn't stand where we wanted to, so we ran round the back streets and stood at the top end of the square where we had a better view. Not many photos to put on here for this night. The first thing we saw were the caparrots doing their traditional dance, and the devils did their dance also. C lifted J up so he could see the dances and we were told later that evening that he was seen on the local TV channel - fame at last. Fireworks from the top of the town hall. 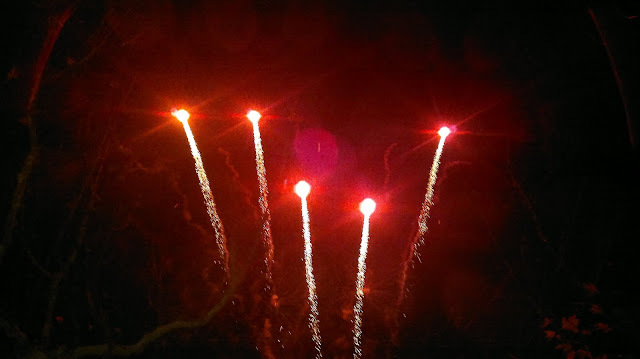 Then at the end of the dances, the lights went out...The music began and a big pyromusic display followed. It was wonderful. 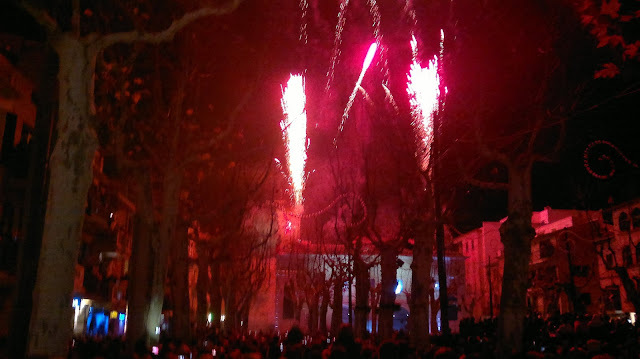 However, poor J, just before it ended, was violently sick, by a tree we managed to find amongst the crowd - oh dear, not a good way to end the evening. It took a while to escape the dense crowd of locals and tourists but we got him home to bed eventually. The next day he seemed fine and we were due to see the Caparrots dance and watch the blessing of the animals (Beneides) at the church, but once we got into town he was unwell again! so off home we went again. 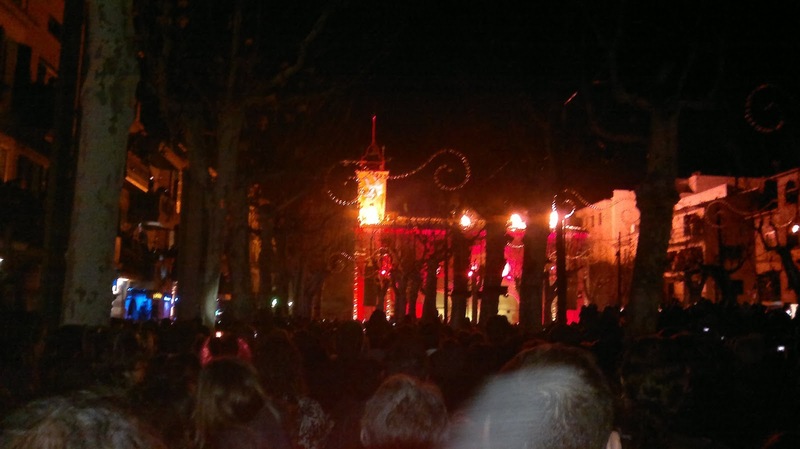 After all the Sant Antoni celebrations all the fires were rebuilt ready for Sant Sebastian. This fiesta is held on the 20th January and on the night of the 19th, we were invited to a party held by one of our good friends, Sebastian. Here in Spain (Mallorca), if your name is the same as a Saints, you have what is called a Saints day. A bit like a birthday, so you often have gifts and a big meal. It was an honour to be invited and very much enjoyed. After eating, we said our goodbyes and left. We looked at a few of the fires still burning and went home. Now the year can really start. Next big fiesta I think is Easter, but there always seems to be something happening here, so I expect there will be celebrations going on between now and then.